ECPA Initiative-Solar Professionals' Academy of the Americas shares its results in a video (Spanish). The renewable energy market in Latin America is taking off, aided by shrinking costs for photovoltaic and new government programs that facilitate business. The Latin American region holds great promise for solar, due to relatively high costs for electricity and ample sunlight, and a fast-expanding middle class that is increasing its energy consumption. ECPA's initiatives focus on Energy Efficiency, Renewable Energy, Cleaner and More Efficient Use of Fossil Fuels, Energy Infrastructure, Energy Poverty, Sustainable Forests and Land Use, and Adaptation. Under ECPA, the lead and/or participating governments and public and private sector partners contribute resources to implement the initiatives. Through the ECPA Solar Energy International trained a workforce and enable them to increase universal access to electricity through renewable energy development. The Solar Professionals' Academy of the Americas (SPAA) trained 50 people representing countries, communities, and organizations throughout Central America and Mexico to design, install, and maintain solar PV systems and to successfully launch and administer businesses in this critically important industry. For more information about the APSA program contact Matthew Harris, SPAA Director. Follow the actions of the workshop! We are pleased to announce that the Department of State has awarded Partners of the Americas a second round of funding for the Senior ECPA Fellows Initiative. This next round has some interesting changes, click here to learn more. Mr. David Williams was selected as one of Time Magazine's Innovators of the Year in 2005. He is a regular contributor to solar publications and has been featured in business and investment publications. He has a background in industrial construction at Shell Oil and Procter & Gamble. He has written several technical and commercial papers. Mr. Williams has a degree in Mechanical Engineering from Georgia Institute of Technology. Jigar Shah is the author of the book, "Creating Climate Wealth: Unlocking the Impact Economy." He is the CEO of Jigar Shah Consulting. He works closely with some of the world's leading influencers and guides policy makers around the globe on key issues to implement profitable solutions to climate change that will unlock $10 Trillion into the impact economy by 2020. On this holiday season, we would like to share with our readers a poem written by our intern, Jessica Smith Soto. We hope Jessica’s words inspire you for an illuminating new year with more green energy and fewer carbon emissions. Happy holidays from the ECPA Clearinghouse Team! As part of the Electricity Generation from Biogas project, financed by ECPA (Energy and Climate Partnership of the Americas), the technical team of SNV and project partner VIOGAZ, held a workshop to evaluate the project results in Tegucigalpa after finishing the installation of the electricity generation plants in ARUCO and COCAFELOL coffee cooperatives. The team evaluated the installation process and the plants´ operation, identifying the challenges, bottle necks and the results achieved so far. These systems are generating electricity from biogas produced from coffee processing waste byproducts. In this way, SNV and VIOGAZ are supporting ARUCO and COCAFELOL in improving their management of contaminating waste, reducing their greenhouse gas emissions and reducing their energy costs. The evaluation helped to define the next steps to achieve successful results from the plants. SNV and VIOGAZ are supporting this process through technical assistance and trainings along with maintenance and operation manuals for the plants. The project team is now focusing its efforts on an intensive stage of perfecting the operation of the plants and collecting data on their performance to evaluate and demonstrate the environmental and economic impact. These data points will serve as input for technical and economic study that the project is developing and will be disseminating in the upcoming months. For more information about this project, please contact Rubén Gallozzi or Osmer Ponce. This article was published by SNV Costa Rica, here. How can you get involved? Attend an Earth Day event in your community, start doing something to lower your carbon footprint, and take a photo of yourself being part of the solution and upload it toThe Face of Climate Change Wall. A local organization in Jalandhar, India—in coordination with Earth Day Network India—is distributing free saplings to students and hosting a discussion about the effects of climate change and ways to mitigate it. Meanwhile in Seoul, South Korea, Ecomom Korea is organizing an “Eco-style” Earth Day Flash Mob, a variation of the popular song “Gangnam Style,” as well as hosting an Earth Day Walkathon and an Earth Day exhibition, which will showcase The Face of Climate Change photo display. In Santa Barbara, California, thousands of people attended the local Earth Day Festival, which included live music, speakers, a Green Car Show, and special awards given to Van Jones and Bill Nye. In Veracruz, Mexico, Tortugas Fundacion Yepez is mobilizing volunteers to protect the habitat of sea turtles by cleaning up the local beaches and organizing a reforestation campaign. The Bent Al-Rafedain Organization in Babylon, Iraq—in cooperation with the Department of the Environment—is honoring Earth Day by documenting the sources of pollution in their community and organizing a media campaign to educate residents and encourage government officials to reduce pollution. In Columbus, Ohio, Green Columbus is mobilizing hundreds of volunteers to pull invasive plants, clean up neighborhoods, and plan trees at over 100 volunteer sites across the state. Far away in Chuuk, Micronesia, Xavier High School is hosting an Earth Day Conference with the theme “The Face of Climate Change” that will feature a neighborhood clean-up, speakers, educational workshops, and an environmentally-themed school song competition. What are you doing for Earth Day? Find us on social media, tell your story, and upload a photo! Update from the field - F2F Volunteers in Colombia! Hello again from Femke and Matt on San Andres Island, Colombia. We are almost one third of the way through our trip and can barely believe how many wonderful characters we have met, and the amount of information we have gathered, over the past week on Old Providence Island and here on San Andres. While on Providence, we visited half a dozen organic farms that are run by native islanders and also met with representatives from the National Parks office and the local farming and fishing cooperative. 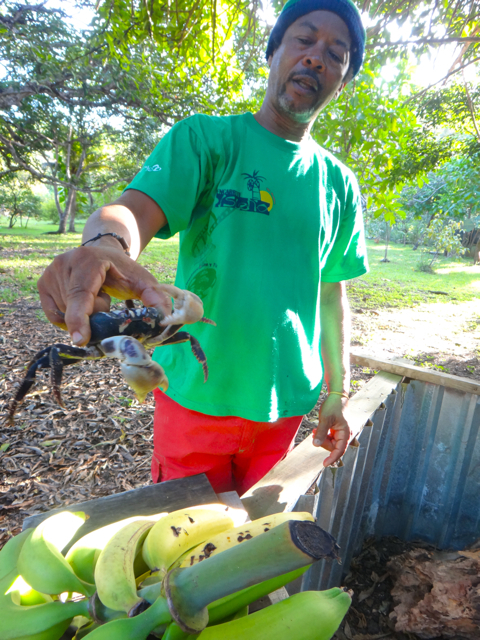 Our goal was to gather as much information as possible about crops and farming practices that have been successful in this Caribbean island environment. Though the soil here on San Andres is different than on Providence (here it is mostly rocky or red clay while Providence is mostly volcanic), the native culture and farming/food traditions are quite similar. We were astonished by the abundance of fruits and root vegetables that are commonly grown on the islands and the enthusiastic willingness of local farmers to share farming secrets with two outsiders from another country. Papaya, pineapple, mango, avocado, banana, ginger, plum, yucca, and yams are a few the common crops with which we were already familiar. Breadfruit, nezberry, soursop, sweetsop, sorrel, jambolin, maracuya, gungu, and noni are a few foods that we only just discovered. The farmers patiently walked us through their farms pointing out important plants and teaching us how they start each from seed or cutting, how they care for the plant, and how they harvest the fruits and roots when they are ready. The past couple of days on San Andres have been equally insightful. One highlight was an early morning visit to an organic farm run by a man named Job Saas. Job inherited a beautiful plot of land from his grandparents and has turned it into a veritable eco-village, complete with a tropical fruit tree orchard, herb garden, and endangered animal habitat—including pens for black crabs, iguanas, and turtles. After touring his expansive space, we sampled fresh sorrel juice and cane syrup cake made from the fruits of his labor. Job will be an important mentor for our work here and has agreed to offer us further guidance as we move forward with workshop planning for the innkeepers. In the coming weeks we have additional trips planned to meet with more local farmers on San Andres, some of the local community leaders, and the environmental protection agency CORALINA, to see how we can pool our collective resources and messaging to generate the greatest results for the community. We are thankful to have found in-country partners that are supportive of sustainable, organic agriculture. However, our visits to the center of town and bus rides across the island are stark reminders of the ever-growing disparity between wealthy foreign proponents of the luxury tourism industry and the native islanders. Large-scale resorts and duty free shops dominate the local economy and have had disastrous impacts on traditional island lifestyles and on the environment. Many of the younger Raizal (native islanders) are moving away from traditional farming work for more modern jobs in the tourism industry. Consequently, very little food is produced on the island and the Raizal are experiencing nutrient deficiencies as they now have to import expensive, lower quality food from off of the island. Our project seeks to address the Raizal’s food security issues while also advancing their ability to benefit from the island’s tourism-based economy. Ultimately, in the final week of our trip, we will host a series of community meetings and a larger workshop on sustainable, small-scale horticulture practices. We have decided to start small and simple, with a plot of commonly used herbs and easy-to-grow vegetables, including: cilantro, peppermint, green onion, basil, oregano, spinach, collard greens, and bell pepper. The goal is to inspire the posada owners with plants that grow fairly quickly in the island climate and produce year round. We will also provide additional resources for those who wish to go further and plant larger crops that require more patience, care, and timing with the wet season (summer). nativas on San Andres Island. In addition to food security, we hope that our workshops will enable native innkeepers to provide high quality organic produce to their guests—giving them a competitive edge in the lodging market and promoting an eco-tourism model over the all-inclusive resort system. We are also aiming to improve the efficiency and safety of rainwater harvesting systems in order to secure a reliable and sustainable water source for irrigation and all household uses. More on the rainwater component next time! About half of the world’s freshwater resources come from precipitation (rain and snow) in mountainous regions. Whereas the impacts of climate change on the stability of mountain glaciers and year-to-year reliability of snowpacks have received much attention, understanding how climate change will impact monsoon rainfall that is actually the dominant freshwater source on mountain slopes and adjacent lowlands in the tropics and subtropics remains a challenge. With worldwide distribution and strong environmental and climatic gradients, mountains are elevated observatories where the impacts of climate variability and change can be first detected. Yet, mountainous regions remain among the least observed regions in the planet. In the Fall of 2011, a science-grade network of 10m towers was placed at high elevations (1,400 to 4,000 m) to measure above-canopy precipitation on the envelope orography of the Central Andes, more precisely in the Kospiñata river valley in the vicinity of Parque Nacional del Manu a collaborative project funded by the Nacional Science Foundation including Duke University, Wake Forest University, and the University of Cusco in Peru. These stations are to be the core of an observing system to understand cloud forest and wet puna hydrometeorology, and in particular climate controls of fog-cloud-rainfall interactions. It is expected that such observations will also provide valuable ground validation data to improve the performance of satellite-based rainfall estimation algorithms (e.g. NASA’s upcoming Global Precipitation Measurement mission) in the region and elsewhere. Ultimately, satellite-based observing systems are the realistic path toward achieving high density continuous observations of mountain precipitation at global and regional scales. The diurnal cycle of rainfall (e.g. where it rains, how much it rains, how fast it rains, how long it rains, and at what time of day) varies greatly from one mountain region to another, and in the same region it can vary greatly with elevation and landform. For example, a comparison among observations on the envelope orography of the central Andes and the central Himalayas indicate that whereas the wet season (monsoon) rainfall totals are about the same, rainfall amounts peak in the early afternoon whereas rainfall intensity peaks in the evening at low and high elevations in the Central Andes, but rainfall amounts and intensity peak during in the evening and very early morning in the southern facing slopes of the central Himalayas at all elevations below the treeline. Interestingly, despite their location in the cloud forest, recent observations from the Peru show that rainfall intensities exceeding 100 mm/hr are not uncommon at roughly 2,700 m elevations, where rates as high as 200 mm/hr were measured a high elevation valley location. These high rainfall rates are associated with landslide activity and debris flows that can cause much landscape damage and loss of life. Rainfall intensity as a discriminant of rainfall regime is critical for assessing the sustainability of freshwater resources in mountainous regions. Light rainfall is dominant at high elevations in cloud forests and wet grasslands in the Andes. Although light rainfall is expected to decrease due to changes in fog and low level cloud regimes, lower relative humidity and higher low level temperatures in the troposphere, morning light rainfall is likely to be more sustainable than afternoon light rainfall depending on how changes in temperature are reflected in the diurnal cycles of temperature in a warmer climate. Changes in fog and rainfall intensity affect canopy harvesting of fog and interception of rainfall on the one hand, and infiltration and soil moisture. Lower surface soil moisture leads to increased soil and boundary layer temperatures, in a positive feedback loop, that would tend to further increase surface layer temperatures and the dryness of upper soil layers, thus affecting understory and forest floor vegetation at first, and consequently albedo and surface temperature, depleting soil moisture from the root zones, ultimately altering runoff production mechanisms and groundwater recharge, and streamflow regimes. On the other hand, if heavy rainfalls were to increase in frequency or in intensity with climate change, this would have major implications for hillslope stability and overall ecosystem resilience besides the human social and economic toll on mountain populations. Vegetation disturbances caused by landslides for example can facilitate the progression of invasive species, and threaten the biodiversity of mountain ecosystems. This blog post was written by Ana P. Barros, Senior ECPA Fellow, of Duke University and the Energy and Climate Partnership of the Americas for Climate Conversations. 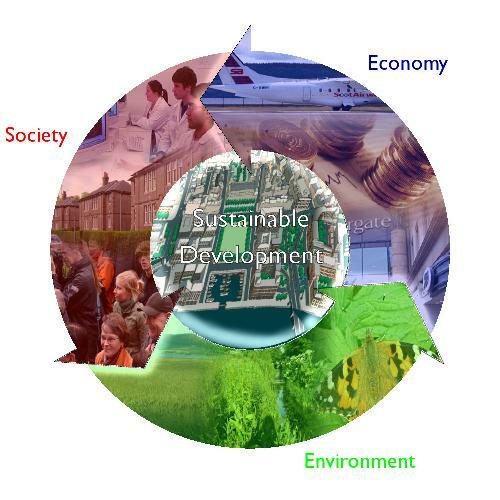 Sustainability has many definitions and provokes a wide range of concepts and approaches. In many aspects sustainability has been overused and lacks the clarity needed to fully understand what it means for a particular place. In my experience stemming from years of hands-on planning in communities of all sizes and locations, one lesson is that one size does not fit all in terms of sustainability solutions. Anyone concerned about a brighter future for the next generation across the globe will promote a tailored, custom solution to the unique needs and situations faced by the range of communities and cultures. In order for the concept to have meaning, it needs to be tied to measures that reflect where we are and whether what we do is making us more or less sustainable. Patterns of human development – physical, social, and economic – affect sustainability at the local and the global level. City and regional planning helps define how, where, and when human settlement occurs. The location of urban development and the choices for reusing and adapting cities make a huge difference in resource consumption. Planners can play a crucial role in improving the sustainability of communities and the resources that support them. Sustainability, seen broadly, should address three main goals, commonly referred to as the “three Es”: Environment, Equity, and Economy. The most sustainable policies and implementation practices will be the ones that simultaneously advance all three goals. For me sustainability is a value-based effort to achieve what is right for society, or in any given community. My organization, The American Planning Association (APA) just held its 104th annual conference in Los Angeles and to kick it off, we cosponsored a Youth Forum on Sustainable Cities in cooperation with our Chinese partners. It is critical that we reach out to young people from all disciplines and all countries to engage them in the process of shaping the future. Too many times, their voices are not at the table when decisions are made yet their generation will be most affected. Widespread urbanization in both the U.S. and around the world is one of the most significant demographic trends seen today. Fortunately, it is also one of the most sustainable trends. Populations in urbanizing areas experience lower birth rates, higher educational attainments, and smaller carbon footprints. In other words, urbanization is at the core of sustainability. Yet for the benefits of urbanization to be realized, there are things we need to do better. 1 Improve citizen involvement. We must engage each other in the discussion of the choices we have based on knowledge and information sharing. Planners are especially trained to help citizens become more informed and engaged in shaping a more sustainable future. In many places, citizens do not have a direct voice in development decisions and resource allocation and participatory governance a new concept that needs our support. 2 Plan according to Nature. Look at the regional picture and protect sensitive areas from urbanization. Much of today’s urbanization is occurring in areas of high risk for natural disasters: coastal and delta regions, earthquake and tsunami prone areas and places susceptible to sea level rise. Planning for hazard mitigation and avoidance is a critical effort that is often overlooked. We must not continue to place people in harm’s way through lack of planning. 3 Respect and learn from traditional patterns and techniques. Today the world is more interconnected than ever and we can recognize and value cultural differences and approaches to creating places. In many cases, historical building styles and materials embody the essence of low energy and sustainability. Equating high technology with modernity is a concept that needs to be questioned as we examine and respect the traditional settlements, designs and cultures that can inform our options. This guest blog was written by Jeff Soule, Senior ECPA Fellow of the Energy and Climate Partnership of the Americas (ECPA), for Climate Conversations.